China’s Yunnan Province is home to several well-preserved old towns, yet amongst this cluster of UNESCO listed treasures, Shuhe reigns supreme. Nestled deep in a forested landscape at the foothill of the imposing Jade Dragon Snow Mountains , Shuhe is a postcard-perfect gem and an idyllic place in which to spend a few days. The compact, walled village is devoid of cars and comprising cobblestone alleyways traversed by picturesque canals. 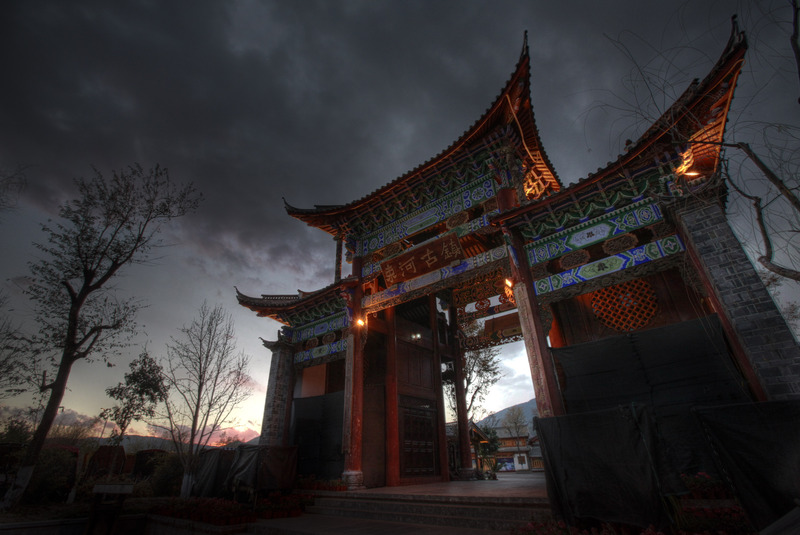 It is an absolutely intoxicating mix of authentic Han, Naxi, and Nakhi architecture, art, culture, and cuisine. Not to be confused with über-popular Lijiang Old Town, Shuhe is a miniature version of its much more commercialized cousin, and located about 5kms to the north. Smaller, quieter, and perhaps much more enjoyable, Shuhe is one of just a handful of historic towns still left standing in all of China. While the majority of the country has undergone tremendous modernization, a few rare gems like Shuhe, Shaxi, and Shangri-La, have been maintained in their former glory. Although the trade you’ll find here is solely aimed at tourists, it still grants a rare glimpse into a bygone era which has all but disappeared. Shuhe’s history dates back over a thousand years, from the time when this was an important stopover along the Ancient Tea Route . At the height of its prosperity, Shuhe was inhabited by various ethnic groups, and the mix of their differing architectural styles is what makes this an utterly breathtaking place. Thanks to tourism, the traditional method of building houses using mud-bricks, stone, and dark timber, is kept very much alive, and although you’ll be hard-pressed to find one dwelling which is more than 10 years old, the style and character is as authentic as can be. Traditional costumes and music of the Nakhi and Naxi people can be admired in Shuhe, where you’ll find colorfully-dressed locals partaking in nightly social dance meetings in the main square. The ill-informed may surmise that this is merely a tourist attraction, yet little do they know that the custom of socializing and dancing at day’s end has been an integral part of these ethnic cultures for centuries. There’s little to do in the town itself, except get lost in its cobble-stoned maze, admire the architecture, enjoy copious amounts of food, and shop ad infinitum. This actually works to visitor’s advantage, as this whole area sits at over 2,000m above sea level. Sedate, pleasurable strolls are certainly preferable to frenetic activity. Here are the highlights of a visit to Shuhe. Strolling alongside crystal clear canals and admiring gorgeous shop-houses decorated with an abundance of flowers, is by far the very best thing to do in Shuhe. Every alleyway is adorned with lanterns and tea lights and the village exudes a most romantic feel, especially after the sun has set. Sifang Jie is the town’s main square, flanked on all sides by craft shops selling local specialties like handmade leather goods and wooden carvings. During the day you’ll see it filled with mini-vans which transport hundreds of Chinese tourists from nearby cites, yet at night the square really comes alive with live music, dancing, and socializing. This is Lijinag’s oldest stone bridge and believed to be over 600 years old. The 25m long, 4.5m wide bridge is made of stones from nearby mountains, and built during the Ming Dynasty . It’s one of the few spots in town which are palpably ancient. One of the most relaxing things about Shuhe is that no matter where you go, you are always accompanied by the soft, flowing sound of water running through the canals. Dragon Pool, the source of the town’s water, can be found at the end of the main road (towards the mountains) where you’ll find an insane amount of happy and very well-fed fish jumping down the pristine streams. Traditional Naxi woven fabrics, colorful leather handbags and shoes, as well as trinkets of all sorts... these are the souvenirs for which Shuhe is most famous. You’ll find shops in every alleyway, however the main thoroughfare leading to the square is home to the nicest (read-most expensive) boutiques in town. The Chinese have taken to commercialism like ducks to water, so shopping like crazy, and dining in style, is what they love most. Pub Street is home to the highest concentration of western-style bars and restaurants in Shuhe, although you’ll find local eateries brimming on every nook and cranny of the village. Prices here are much cheaper than in Lijiang’s Old Town, however the quality of food served is mediocre at best, especially in the Western-food department. You’ll be better off to indulge in a hot-pot, the local specialty, and do note that fancy establishments do not necessarily serve better food. Repeat business here is almost non-existent, so it’s actually the cheap and cheerful joints which take more care in their food preparation, to cater for the 3,000 or so inhabitants of the village. Within the confines, or walls of Shuhe, you’ll find an abundance of gorgeous boutique hotels, hostels, and even a Banyan Tree Resort. If you want to save some dough, best to pick a guesthouse just outside of the village walls, where prices drop dramatically. As long as you are within walking distance this is a really great option. There are many who prefer to stay in Shuhe when visiting Lijiang, as this old town is more atmospheric in the evenings and accommodation more affordable. All of the guesthouses are built in the old Naxi architectural style and are insanely charming. Sleeping in an authentic Shuhe guesthouse is arguably one of the highlights of a stay in town. The entire area around Lijiang can suffer from harsh winters, even though this is actually the best time to visit Shuhe as crowds will be almost non-existent. If you want to set off on hikes to nearby mountains, then best you visit in May or June, when you’ll also find flower-filled plains at their very most colorful best. The rain season from June to September can be a little bothersome, if only for the fact that cobblestone streets are remarkably slippery during rains. The four entrances into town are adorned with a ‘toll booth’, where a ¥50 RMB ($8.00 USD) fee may or may not be collected, depending on whether the attendant has shown up for the day. If you’re staying within the town’s perimeters you will not be required to pay the entrance fee, although the attendant may insist on calling your hotel to confirm your accommodation.